A perk of reading quality diabetes books or articles is having the confidence in the content while learning at your own pace. You are completely in control of your space and thus, can improve how well you understand a tough topic. You can improve your health a little bit at a time and minimize the feeling of being overwhelmed. Theresa’s style is friendly and has just the right amount of science. Her materials typically include visual breaks with drawings, cartoons, a sprinkling of diabetes humor, and options to consider. Her books have icons to help you navigate to the areas you wish to read. And if you want to skip the science, you can forward to the specific actions to take now. Some examples of Theresa’s writings are below. You can also find other helpful reading under the Resources page. 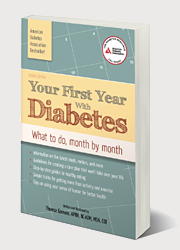 Your First Year with Diabetes (2nd edition), 2014. Your First Year is a 12-month plan for anyone recently diagnosed with diabetes or for those wanting an inspired self-management plan. Taking readers step-by-step through the first year, this practical guide provides the perfect blend of easy-to-digest information presented in a positive light, builds on need-to-know skills, and offers reasonable action items from which to choose for personal goal setting. Everything is covered, from what to eat, to how to stay healthy and free of complications, to how to handle stress. Your First Year is a health road map for people with diabetes, regardless of type. It reviews in-depth topics such as the vast array of medications (including insulin and insulin adjustment), ongoing nutrition education, physical activity and weight management strategies, and comprehensive resources including websites and apps. You will learn what all the numbers mean and get insider tips on ways to build your successful diabetes management plan. In addition to her clinical expertise, author and cartoonist Theresa Garnero brings some much-needed levity to a very serious topic. The science provided in this book is balanced out with patient-inspired, therapeutic humor, and diabetes cartoons. This unique approach is a breath of fresh air to diabetes self-care. It resonates well with people who thrive on messages of hope in a disease state that is often disheartening and overwhelming. Your First Year is a friendly, interactive, and informative resource that helps people to discover meaningful ways to find and stay motivated on their path towards healthy living. 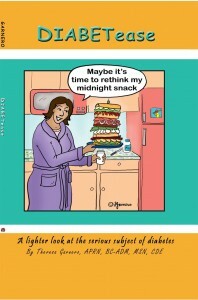 DIABETease is a book of humorous illustrations, which inject a little fun into the otherwise serious side of diabetes. The ladybug mascot, named LadyBetes, that appears throughout the book also provides generalized facts and tips about the disease. Through her amusing cartoons, Garnero hopes to reduce stress, while inspiring interest in diabetes self-care management, for both adults and children. American Diabetes Association (ADA): Diabetes Forecast, 2014.
dLife.com, 2006. This article was also cited in the Polish Journal of Endocrinology, 2011.